Chatham Connection: Bob Wilson on bass guitar. Bob began playing in many popular local acts in town such as “Friends” and “Quadrant” before being scooped away by major players such as Kim Mitchell and Troiano. By 1981 he’d left Capitol Records and set up his own Black Market Records and experimented again with another new project, also called Black Market. He went into Phase One Studios in Toronto with a cast rounded out by bassist Bob Wilson and Paul DeLong on drums and came out with CHANGING OF THE GUARD, distributed by El Mocambo Records. The album featured a myriad of guest appearances, including Roy Kenner, whom he’d worked with in Mandala, Bush, and The James Gang, fellow James Gang alumni Prakash John and Troiano’s then-wife Shawne Jackson (all of whom had guested on his solo albums frequently as well). The no-nonsense power trio delivered the goods – straight forward rock with little production magic. Tracks like the swingle “Dr. Jeejay’s Band,” the lead off title track, and the four songs co-written with Kenner were stripped down ballsy numbers that didn’t shy away from energy and power. 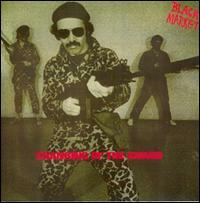 But despite the enthusiasm Troiano had for his new project, next to no air play and less than wonderful album sales meant Black Market only captured the eye of his most die-hard fans. He disbanded the group after a couple of North American tours and went back to behind the scenes work, producing other acts and doing scores for television and films. The other members in Black Market, Bob Wilson and Paul DeLong both went on to work as session musicians for a number of artists.